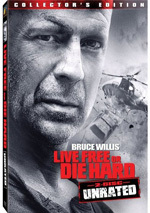 Bruce Willis, Danny Aiello, Andie MacDowell and Sandra Bernhard star in this funny action/adventure comedy. Willis is Eddie "The Hawk" Hawkins, the world's most famous cat burglar, who, after 10 years in prison, is ready to go straight. But it's not going to be easy for The Hawk. The mob andthe CIA have conspired to blackmail Eddie and his partner (Aiello) into stealing three da Vinci masterpieces from the most heavily-guarded museums in the world. Sounds simple, right? WRONG! While trying to steal the goods, Hawk falls in love with a beautiful but schizophrenic nun (MacDowell) and isrelentlessly pursued by the greedy and powerful Minerva and Darwin Mayflower, who want the artworks as part of their twisted plot to ruin the world's economy. It's wall-to-wall action as the wise-cracking Hawk saves the world, wins the girl, and gets the last laugh. Although Bruce Willis has made quite a few stinkers over the years, I think 1991’s Hudson Hawk remains his most notorious dud. Budgeted at a then enormous $65 million, the flick received scathing reviews and earned a pathetic $17 million in the US. It quickly turned into a punchline and a movie most involved probably wished they’d never made. I saw it theatrically at a bargain, second-run theater since it didn’t last on the prime screens for long. I suspect the movie’s negative reputation may have been part of the attraction, as I wanted to find out if Hawk was really so terrible. At the time, I disagreed with the bad reviews. I don’t think I felt Hawk was a classic, but as I recall, I enjoyed it. With that as the background, I was curious to check out the movie again 16 years down the road. 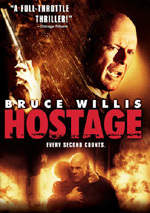 Willis plays Eddie “The Hudson Hawk” Hawkins, a reformed cat burglar finally in free society again after 10 years in the joint. Unfortunately, ala Michael Corleone, the Hawk finds it difficult to escape his past. From his parole officer to Mafia sorts, a variety of associates pressure him to get involved in an art heist, but he resists their entreaties. Eventually he gives in, though, and gets involved in the crime with his pal/business partner Tommy (Danny Aiello). They pull off the caper, but their involvement doesn’t end there. Some odd events ensue, and Hawk manages to remain at the center of the action. The movie follows his attempts to solve various mysteries – and also to woo Anna (Andie McDowell), a mysterious babe who shows up at many of Hawk’s stops. I was 24 when I saw Hawk and liked it. Is that too old to chalk up as an instance of youthful stupidity? As I watched this film in slack-jawed awe at its sheer badness, not for one second could I figure out why it entertained me back in 1991. If the film does anything right, I can’t discern where that success might lie. Oh, it boasts a good cast, but it uses each and every one of them to poor effect. We don’t get performances here; we get muggings. Each role is overplayed to an absurd level, as all the performers fight to see who can chew the most scenery. This knob-turned-to-11 style of acting wears thin rapidly and makes it tough to last 10 minutes into this thing, much less tolerate 10 times that length. Perhaps if Hawk conjured a compelling story, it might become engaging. Unfortunately, as far as I can tell, there’s no real plot here. Oh, we get oodles of plot twists, but the film remains painfully skimpy in terms of actual plot. It’s a conglomeration of little zigs and zags without much coherence or attempt at true storytelling. And then there’re the quirks. Oh my, is this is quirky little film! We get unusual traits, tics and all the like piled onto us. As with all the plot twists, these attempt to fool us and ensure that we don’t notice the film’s inherent lack of substance. I guess that worked when I was 24, but apparently I’ve gained a little wisdom with age. Poor editing makes the film even more of a clunker. The product delivers the impression that vast hunks of material were eliminated from a longer cut and the remains were joined together without much logic or effort. The flick jerks from one moment to another without much coherence or smoothness. One minute Hawk refuses to steal again, and then he’s on the job. What happened? Too many awkward moments like this emerge, and these turn the flick into even more of a jumbled mess. I suspect that when someone criticizes Hawk, fans will play the “you didn’t get it!” card. I get the impression its adherents see it as a groundbreaking piece of satire that played with the action film rules and made its own new kind of product. No, the problem with Hawk isn’t that I didn’t get it. I fully understand what the filmmakers want to do here – I just don’t think it works. For satire to succeed, it needs to be incisive and/or funny. At no point does the film succeed in those realms, and it simply proves idiotic and tiresome. Hudson Hawk touts itself as an action/adventure/comedy, but the end result falls into “Hawk of all trades” territory. It achieves none of those goals and becomes an actively unpleasant experience. You’ll find no fun or excitement in this justly maligned bomb. 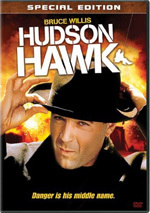 Hudson Hawk appears in an aspect ratio of approximately 1.85:1 on this single-sided, double-layered DVD; the image has been enhanced for 16X9 televisions. Much of the time the transfer seemed good, though it showed a few weaknesses. My main complaint stemmed from some noticeable edge enhancement. These haloes cropped up through the movie and made the film less defined than expected. While sharpness usually appeared positive, it sagged more often than I’d like. No issues with jagged edges or shimmering occurred, and source flaws seemed fairly minor. I noticed a few specks, but grain could be somewhat heavy. I attributed this to the film stock of the era, but I still felt the flick was awfully grainy. Colors looked pretty good, though they suffered from some film stock issues of their own. While most of the hues appeared reasonably lively, the tones occasionally came across as a bit muddy. Blacks fell into a similar range; much of the film displayed good depth, but some inkiness occurred as well. Shadows tended to be reasonably well-developed, with only a few moderately dense shots on display. This was an acceptable transfer but not a memorable one. Similar thoughts greeted the generally ordinary Dolby Surround 2.0 audio of Hudson Hawk. The soundfield opened things up to a moderate degree, though not with great dimensionality. Occasionally the mix allowed various elements to zip around the room and broaden matters, but the track didn’t bring out great localization or placement. Still, these pieces managed to create a fair sense of environment, and they used the surrounds in a fairly active manner. Audio quality was dated but acceptable. Speech seemed natural and concise, though some bad looping made the lines a bit flat at times. Music showed decent definition, as the score was reasonably vivid. I didn’t think those elements boasted great life, though, and effects fell into the same vein. Those aspects of the track showed fair delineation and clarity but lacked much oomph. All of this was good enough for a “B-“ adjusted for age. We find a mix of extras for this special edition of Hawk. First comes an audio commentary from director Michael Lehmann. He provides a running, screen-specific piece. Lehmann discusses the project’s origins and genesis, cast and performances, musical selections, stunts and effects, locations and sets, production design, and general movie trivia. Lehmann also addresses the movie’s critics at times and tries to explain the film’s tone. Though the chat lags on occasion, Lehmann usually provides a nice look at the flick. He defends the film but doesn’t seem defensive. Indeed, he’s willing to offer mild self-mockery at times, such as with his frequent semi-joking remarks that the movie was a big hit in Europe. Lehmann creates a reasonably informative and engaging discussion. Another form of commentary comes via the Hudson Hawk Trivia Track. This text accompanies the film and looks at topics such as cast and crew, sets and locations, the story and its development, music, editing and reshoots, cinematic influences, stunts, production complications and budget, and a few other areas. Like many text commentaries, this one provides a rudimentary look at the film but it rarely excels. Some of the problems come from the many times we must wait a while to get notes; much of the movie passes without text. Some of the elements don’t tell us much, either, as they can be pretty basic. Still, by the end, we’ve learned a reasonable amount about the flick, so this is a moderately effective presentation. Deleted Scenes fill a total of five minutes, 37 seconds. These show us a cut subplot about Hawk’s murdered pet monkey, how Tommy Five-Tone got his name, the approach of Hawk and Tommy on the way to the castle, and the CIA agents as they mock Hawk. We also get a quick look at some blue-screen work to show how they filmed flying shots. Even for Hawk, the monkey plot would have been idiotic, and the Five-Tone tale slows things down to a crawl. The others are simply superfluous. All of these cuts made sense. Two featurettes follow. My Journey to Minerva runs 10 minutes, 56 seconds and concentrates on Sandra Bernhard. During this tongue-in-cheek piece, she offers a monologue that discusses her casting and other aspects of her work on the film. Clever, snarky and funny, “Minerva” proves vastly more entertaining than the movie itself. It becomes a very good extra. 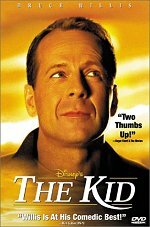 For the 29-minute and 55-second The Story of Hudson Hawk, we hear from executive producer Robert Kraft and actor Bruce Willis. They discuss their relationship, the origins and development of Hawk, aspects of its creation, and thoughts about its tone and reception. This sounds like a great idea, and I’m very pleased to find Willis’s involvement, as I worried he’d try to disassociate himself from the continued stench of Hawk. Unfortunately, “Story” proves only sporadically useful. Part of the problem comes from its self-indulgence. The first few minutes just show the pair as they make music, and even when they start to talk, their comments tend to meander and ramble, so it takes a while to get into interesting insights. There’s a smattering of good notes on display here, but the product never quite congeals into a satisfying program. Next comes a music video for the “Hudson Hawk Theme” by Dr. John. A typical piece of Cajun funk from the Dr., the song neither soars nor sinks. With its mix of movie clips and lip-synch material, this is a dull video, though. At least Bruce Willis shows up with Dr. John for a few shots; he doesn’t really do much, but that side of things creates a minor diversion. Finally, we get a collection of trailers. This area includes ads for Monty Python and the Holy Grail, Dynamic Duo, Ultraviolet and The Detonator. No trailer for Hawk appears here. If I ever get a chance to chat with my 24-year-old self, I’d like to ask him why in the world he actually enjoyed Hudson Hawk. The flick entertained me 16 years ago but stunned me with its badness at 40. The DVD offered decent to good picture and audio as well as a pretty nice set of extras. This turns into a reasonably satisfying release for a dopey film.